Gather round young and old as I tell the tale of long ago. It all started in a quaint inn1 on the shores of a mighty ocean in the Land of OB. Two brothers of a great clan of craftsman2 gathered around a table of libations, sheltered from the autumn cold. They spoke of warm summer winds on the beaches of OB and recent triumphs therein. It had been a gathering of villagers from far and wide to view a spectacular spectacle of light and sound3. This had given great joy to the local trade and citizens of OB alike. It was the beginning of renewed spirit that had nearly been lost in this enchanted land. Having proudly championed a role in this milestone, the brothers spoke of new campaigns to once again bring happiness to their fellow Obceians. With a chill in the air and the sounds of pounding surf close by, a harbinger of the coming festive season, they spoke of the celebrated great tree in a land far far away, in the Plaza of Rockefeller. This giant pine marked the start of this season of giving and rejoicing, a rare happenstance among the barbarians in this York of New. Alas, the brother who was both Rich in spirit as well in name, inspired by the Tree of Rockefeller, proposed of a 20 feet tree that would grace the sands of OB with much fanfare and celebration. As the mead flowed from the casks, this illusionary tree grew to 30, 40, then 50 feet. Yes, there were the naysayers, I the teller of this tale being one, who doubted the dreams of this man, who was Rich in spirit as well in name. Undaunted, Rich proclaimed he would find a tree that would rival that of Rockefeller. They heard of an elder in the great white north who was the procurer of such trees of legend. Rich knew he must travel many days into uncharted territory to seek this man. Rich sought the assistance of a fellow adventurer Kenny, the keeper of a trusty cart with many horses. They knew days of treacherous travel lay ahead, even through the dangerous highlands of the Vine of Grape, where many carts who ventured there, now lay ruined along its perilous icy roads. Yet they knew they must venture far north of even the Vine of Grape. After many days of travel (to told be in other tales), Rich and Kenny had finally reached their destination. The snowy slopes of an ancient volcano4. Where it is said mystical fairies and pixies live within. It was here they found the elder, the procurer of legendary evergreens. True to his word, he lay upon the cart a tree of such grandeur, of such magnificent proportions, a tree worthy of tales to be told through the ages, a tree worthy of being the first. With the tree safely aboard, the return journey seemed to almost magically transport them back to the Land of OB in the blink of an eye. There at the end of the main street of OB, upon the shores of the great ocean, the 60 foot tree was placed securely in the sand. The villagers and the tradesmen, with much gladness in their hearts, gathered around silently to admire this tree, this symbol of community, of hope, of redemption, of love. A tree that had once been just the imagination of a dreamer. Then with much joy, they marched down the main street, they laughed, they sang, they celebrated. Leading them all was a man who was both Rich in spirit as well as in name. Even though Rich has passed, his tradition and his spirit shall continue. For almost 30 years the Ocean Beach Geriatric Surf Club and Precision Marching Surfboard Drill Team and Gidget Patrol have been paid thousands of dollars to attend convention soirees to perform for ten minutes and then proceed to drink the conventioneers sponsored booze, devour their buffet and chase after their spouses (It’s in the contract). In 1996, the Republican National Convention was held in San Diego. A year earlier the Grand Old Party gained control of both houses for the first time since the 1950s and they were looking to party like it was 1999. Who better to party with than the Ocean Beach Geriatrics. Junior Congressman Brian Bilbray, a surfer and Corona drinker, was a big fan of the club. So when the Young Republican Congressional Caucus were planning a fundraiser for the convention, Bilbray suggested the Geriatrics be part of the entertainment. Apparently the event was not vetted by the Republican National Committee or the FBI. Not only did the club harbor a few liberal Democrats but a contingent of commie pinko hippies as well. On the night of the party, club members were herded into a storage area to await their grand entrance. This was also where the guest’s ample goody bags had been assembled. The room was still full of leftover elephant shot glasses, Jack Kemp miniature footballs and the very cool Bob Dole rubber puppets. Not wanting to see any of these historical trinkets to be tossed into a landfill, many members of the club procured a Bob Dole puppet as a souvenir. At 8:00 the club did its required ten minutes on the dance floor, twirling surfboards and flipping beach chairs, as the band (made up of freshman congressman) played La Bamba. Then quicker then you can say Ba-Ba-Bamba the Geriatrics pounced on the open bar and the greatest buffet they had ever laid eyes on. Within minutes, four dozen fresh Pacific Oysters, ten dozen jumbo Tiger Shrimp, two cases of Dos Equis beer and a bottle of 1800 Tequila Reserva Reposado were consumed. Long time no post. I hadn’t checked the site in a while and when I finally did I found a bunch of comments from 2 years ago. Sorry. I better get some new stories up as the mind is getting fuzzier everyday. Check back later this month. Adios for now! My first magical musical memory was the band The Hurricanes, a hot blues band that played regularly at Le Chalet on Newport Ave in late 70’s. I wish I could remember who was in the band. I think it included Obciean Aristole Georgio on harmonica and Blond Bruce on guitar. Tomcat Courtney with Obciean Mighty Joe Longa playing the organ at the very small and wall to wall Texas Teahouse on Voltarie. Sundays at Winston’s with Earl Thomas. Also Earl playing at my wedding reception. Seeing Jewel at the Java Joe’s right after she released her first album. Fabulous Thunderbird front man Kim Wilson with his all-star blues band (Gene Taylor on piano) at his annual December gigs at Winston’s. The San Diego Symphony Orchestra at Dusty Rhodes Park for the first and last annual Peninsula Arts Festival. Billy Bacon and the Forbidden Pigs at Winston’s and the O.B. Street Fair. In late 1984, we heard that the game show Family Feud was auditioning in San Diego. This was the Richard Dawson original Family Feud with five family members, which seemed to the five James brothers a good omen to try-out. After a rigorous 1/2 hour of training (“good answer, good answer!” “LOUDER” “good answer, good answer! !” ) and strategizing (don’t ask Richard Dawson about Bob Crane), we were ready. At the Scottish Rite Center in Mission Valley we spent 2 hours being put through our paces by the shows producers. They tried to mess with our heads by one moment shouting encouragements (“that was very perky, we like perky”) and another moment making disparaging comments about our answers (“Are you high? Nixon was not a “Evil Fictional Character”). They wanted to make sure we wouldn’t crack in a game situation. To our surprise we were asked to come back the next day. After more of the same, we were told that the James Family would be contestants on the Family Feud. We had to cancel our first recording date due to conflicting plans. We waiting patiently for our rescheduled date, our date with destiny and Dawson. Maybe we would be so popular we would be asked to star in our own Musical/Comedy Hour. “Here’s the James Gang with special guest Madonna.” Having just split with Sean Penn I could have been the next Mr. Madonna. 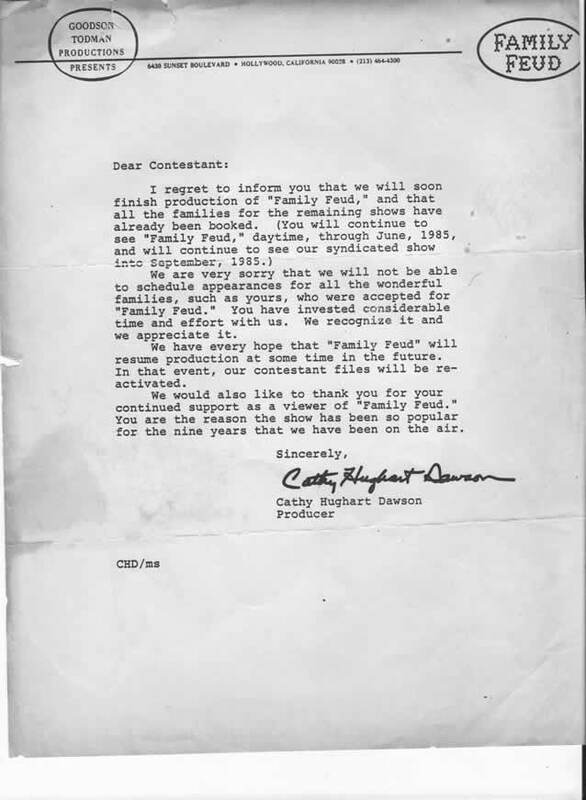 Finally a letter (click on above image) arrived from Goodson Todman Productions. Damn those Nielsens, damn them to hell. The show had been canceled. My dreams of stardom and adopted children from Africa were crushed. Former baseball pitcher David Wells is the most famous person from Ocean Beach. He is also prime example of the popular adage: you can take the boy out of O.B., but you can’t take the O.B. out of the boy. (o.k. I coined the adage.) He was always considered a non-conformist in the baseball world. Growing up with the San Diego Chapter of the Hells Angels cheering you on at Little League games, would give you a different perspective. 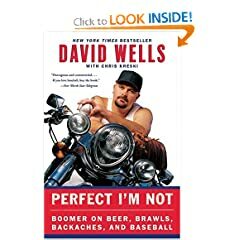 If you want to learn about David I suggest you get his book: Perfect I’m Not : Boomer on Beer, Brawls, Backaches, and Baseball. My story takes place in January 1997. David was in town to attend his beloved mother Annie’s funeral. When in town, David always traveled with his Point Loma posse. These were guy he grew up with, guys he went to high school with. It was 1:30 in the morning, David Wells and his entourage were cruising O.B. in his Lincoln Town Car. Parking in the Hodad’s side lot, the crew got out to make a quick brewskis run to the corner market. They thought it would be so quick they left the car running with its doors wide-open. Meanwhile Cheswick regulars, Armand and Steve, were just completing an evening of barhopping and were on their way home. Spotting the unattended car in the lot, they thought this was the funniest thing they ever saw. To add to the drunken hilarity, Steve decided to turn off the car and put the keys under the seat. A homeless person watching from a dark corner was thinking he was glad to be schizoid, not crazy like all these other dudes. As David and one of his buddies neared the car they noticed it was no longer running, looking in they saw no keys. The homeless guy pointed down the alley and yelled something incoherent. Understanding, David and his friend ran down the alley. Spotting Armand and Steve across the street they ran until they were face to face with the key suspects. “Hey, where’s my f@**ing keys, David snarled. “Keys, I don’t know anything about any stinking keys” Armand replied unconvincingly. Just then the rest of David’s gang came flying around the corner. Feeling like a cornered rat, Armand took the first swing. David “Boomer” Wells had just received a multi-million dollar contract from his new team the New York Yankees. Now he would have to explain to George Steinbrenner how he broke his pitching hand. Armand thought he deserved some of that contract, being it was his face that David broke his hand on. Armand stuck-out in his lawsuit and never saw a dime. Moral of the story: Don’t slowdown if your heading for home. In 1983, I was 25 years old and was serving my second term as president of the Ocean Beach Merchants Association. My relationship with our Councilman Bill Cleator was sometimes strained, but I think he still respected me. A city ordinance was to be passed for a test ban of alcohol on all city beaches after 9:00 pm. Thinking this was way too early for my fellow Obcieans, I proposed to our councilman that the beaches in Ocean Beach be allowed to have alcohol until midnight. To my surprise Bill Cleator agreed. This provision only lasted a couple of years before all beaches had a permanent alcohol ban after 9:00 pm. For a while though, I was happy to know that you can fight city hall. Find me and win a prize.Many don’t even realize that the Ocean Beach Bowl even existed. It was located on Bacon Street between Newport and Santa Monica Ave. Its eight lanes were built in the 1940’s and were connected to the Arizona Cafe*. *while they occasionally served food, the Arizona Cafe was in reality one of the best dive bars in San Diego. In late 1980 the Ocean Beach Bowl become home to a unique Monday night league. My brother Ron was a member of OMBAC (Old Mission Beach Athletics Club), he proposed a Ocean Beach version to pursue our athletic endeavors. 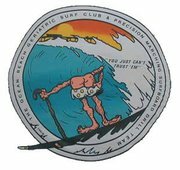 The Ocean Beach Athletic and Recreation Foundation or OBARF was born. The first activity was a Bowling League. 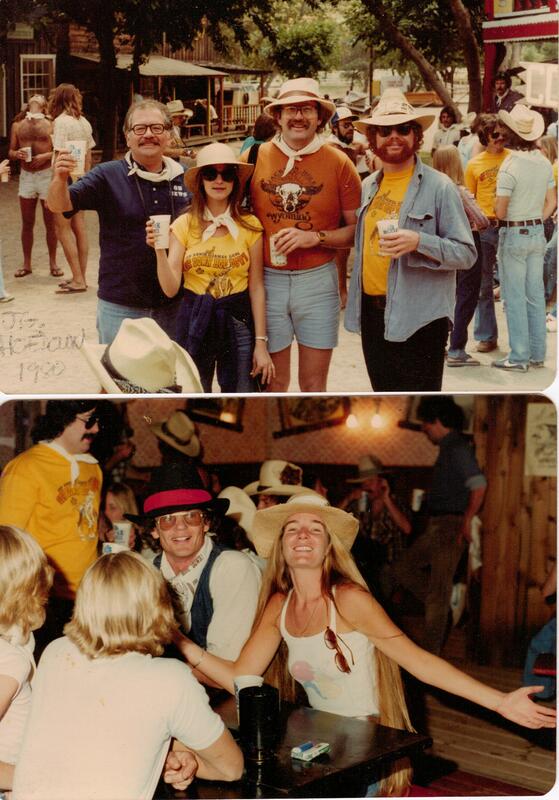 Members included many James Gang employees and friends from the Sunshine Company Saloon. 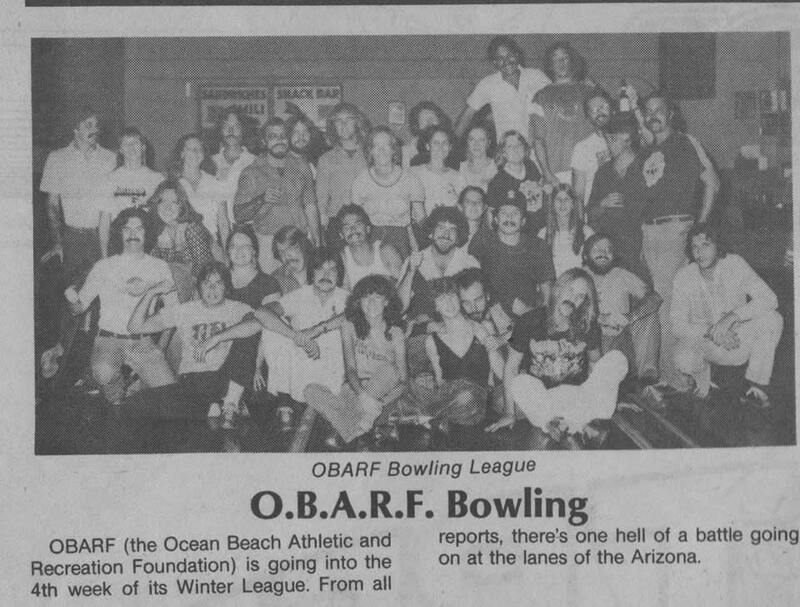 The league was also where my brother Rich developed the national fad of “Disco Bowling.”Now I won’t say we weren’t very good, but our best OBARF bowler, with a 162 average, was a certified blind accountant (he was certified blind, as an accountant I’m not so sure). He was a hell of a spot bowler. Being connected to the Arizona Cafe, allowed cocktail waitresses to keep us supplied, without missing a turn. We kept them busy throughout the evening. We also kept Little Joe, the Alley Manager, busy as well. Little Joe had been working at the O.B. Bowl since he was a kid. He later became a popular bartender at the Arizona with Big Joe and Middle Joe. I loved Bowling Night, I even bought my own shoes and a bowling ball. A few years later, Brunswick, who leased the old equipment, decided to rip it all out. That was a sad day, but a fortuitous day for the James Gang. In 1990, after the James Gang lost their lease on Newport Avenue, they were able to move into the old bowling alley building. If it had not been available they most likely would have been forced to move out of O.B. In 1978, James Gang Custom T-Shirts was beginning its third year. Business was booming and my brothers felt it appropriate to celebrate our success with our friends and family. Time to have a party. Fitting the company name, a outlaw/cowboy party theme was chosen. In a corner of the Pac Shores my older brothers outdid themselves, devising the James Gang Get Down, Hoe Down. A quaint party with three or four hundred OBceans, getting and hoeing down. It was agreed that a party of this magnitude could not peacefully take place in the confines of Ocean Beach. It was time to head to them there hills. 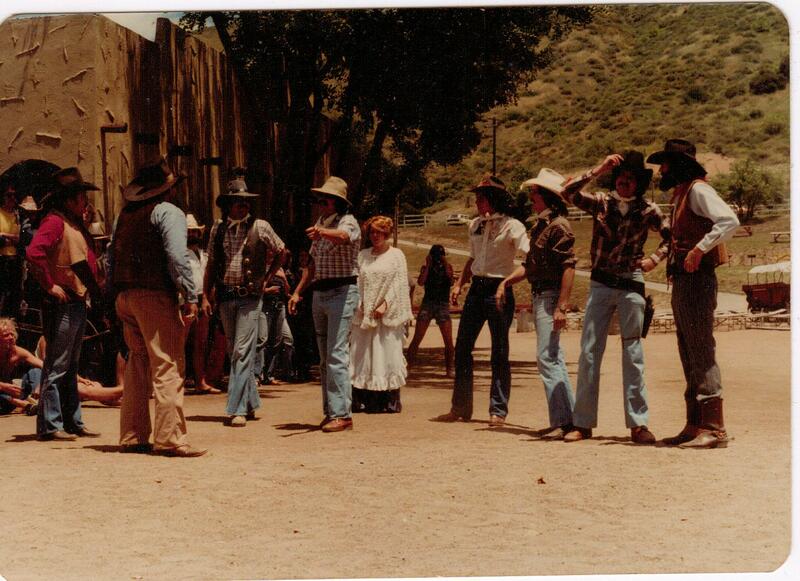 The Big Oak Ranch was a frontier town/amusement park in Harbinson Canyon outside of El Cajon. It was perfect, an isolated patch of land next to a nudist colony. A $20 ticket (a bandanna) got you a t-shirt, all the beer you can drink, live entertainment, a BBQ dinner, a barn dance, a piece of hard earth to sleep on and a Bloody Mary breakfast. The fiesta started with the Shoot-out at the O.B. Corral. The James Gang (my brothers and I) ambled down Main Street with six-shooters at our side, looking for the Sheriff and his deputies (Played by the Big Oak Cowboy Players). Apparently derogatory remarks were made about wearing flip-flops with cowboy hats. Soon shots were fired and as the script foretold, I and several others lay on the hot ground as the drama played out. Shotgun touting women folk finally came out the saloon and dispatched the rest of the men on Main Street. We then dusted ourselves off to a round of applause and beers. On one corner a one-man-band entertained the crowd, playing a Willie Nelson tune with his drum, harmonica and guitar. In the dusty saloon a piano player cranked out songs as Obceans sang along. My brother Pat’s hands were soon bloodied as he strummed a rousing rendition of “She’ll Be Coming Around the Mountain” on a washtub bass. In the meantime, a horseshoe tournament and a Chili Cook-off kept the rest of the party occupied. It was soon dinner time, hundreds were served carne asada and other Mexican fare while listening to a mariachi band. As darkness fell, the barn filled with the Country/Western music of the band Tall Cotton. Everywhere you looked boots and bare-feet were stomping to the beat. Attempts at the Texas Two-step in short order became the O.B. Misstep. Later that evening, gunshots were heard coming from the parking lot. We figured the Big Oak employees were firing off the rest of their blanks. Come to find out later, the owner of the ranch, Rock Kreutzer was knocked over the head with a crowbar by a disgruntled former Big Oak cowboy. The shots we heard were live rounds being fired by Rock’s employees hitting the fleeing attacker’s car tires. With sheriff helicopters overhead, the culprit escaped. After the band played their last song the party-goers headed to their tents for much needed sleep. For those who lacked the foresight to set-up their tents before drinking, their sleeping bags and blankets soon haphazardly littered the hillsides. For those slackers the sunrise came to soon. Waking to the bright reality of the hard ground, after a day of consuming muy cervazas, was indeed torture. Not that the tent dwellers had it a hell of lot better. Under the shade of a large (big) oak tree, salvation came as Rich and Ron James had laid out a liquid breakfast. Reminiscent of a zombie movie, the groaning masses crawled out of sleeping bags and slowly stumbled down the hill to consume the replenishing Bloody Marys. People tend to forgot the pain of good party and James Gang Get Down, Hoe Down played out two more years at the Big Oak Ranch. Each year had it’s share of added drama though. The second year campers were woken to the sound of firefighter’s bulldozers putting out a brush fire a few feet from where they slept. Shortly after the third event, Rock Kreutzer was convicted of shooting his son-in-law and is still in prison. The fourth and last year had to be moved up the road to Stallion Oaks Ranch in Descanso. Of course being a ranch, there were horses. Of course, we came to find out, horses and beach drunks don’t mix. An inebriated female, known to be a six in the morning Beach Club Cocktails and Live Entertainment regular, tried to pet the wrong end of a nice horsey. She was summarily kicked in the shins. After our insurance company paid her bar tab for the next year, we decided to call it quits. One night in early 1988 I was quaffing a few Henry Weinhard’s (my beer of choice at that time) at Cheswick’s West Tavern. Having heard that my bartender, Valerie, had recently become engaged to an Irish lad, Derek, I told her the story of my dad performing my brother’s wedding (see story below). Inspired by the story, she asked if I would become ordained and officiate her ceremony. After a few more Henry’s on the house, I readily agreed. I was, after all, a chip off the old block. The next week I sent off my request for ordination, with a donation of $10, to the Universal Life Church of Modesto, California. When I wasn’t waiting by my mailbox, I was at the library preparing my ceremony (The Prophet, Apache Wedding Blessing, Wedding Ceremonies for Idiots). Just days before the wedding I received my ministry license and got my tie back from the dry cleaners. I was ready. On that special day, in the bridesmaid living room, I performed my first duties as the Right Reverend Mike. The longest, knee-trembling, nerve-wracking, cotton-mouthed, three minutes of my life. It wasn’t so much being in front of crowd, it was the enormity of the event. I wondered, who was I to sanctify this act, would Valerie and Derek later regret this decision and blame me, would I be smitten by lightning and leave a stain on the carpet. I was soon booked by numerous couples to perform their nuptials. Still not feeling completely comfortable in this role, I at first refused any monetary compensation. I did however accept a donation of a case of domestic beer (Henry Weinhard). Later that would upgraded to imported beer (Pilsner Urquell) and even later, having stockpiled more beer than I could drink, I began accepting honorariums of $100 (Crisp Twenties). Since 1988 I have performed something like 50 or 60 weddings. If I knew in the beginning I would do more than a few I would have kept count. I was honored to later perform my brother Ron and his wife Mary’s wedding. Statistically my record follows the national average of success for marriages (around 50%). I’ve only had to honor my guarantee twice “If your marriage fails, your next ceremony is on the house”. There has been many wonderful moments sharing this day with the hundreds of brides and grooms. I always loved the expression from the aunt from Albany as she spied me doing shots with the groom before the ceremony. Or the shocked look from grandmas as I did my James Brown impression at the reception. There was the day I performed two weddings at La Jolla Shores, after the minister failed to show at a neighboring ceremony, I was quickly recruited from the first couple’s reception. Unbeknownst to the second couple, I had already consumed a few cocktails and may have forgotten the “I do” part during their vows. I think it was still legal. No, really.